So DC/Warner is probably figuring there’s a good chance that their shaky Justice League setup is going to be pretty weak against Marvel’s Avengers Universe, so they’ve got a backup plan. An oddball side property which, if they’re lucky, might be a surprise hit like Guardians of the Galaxy was for the other team. 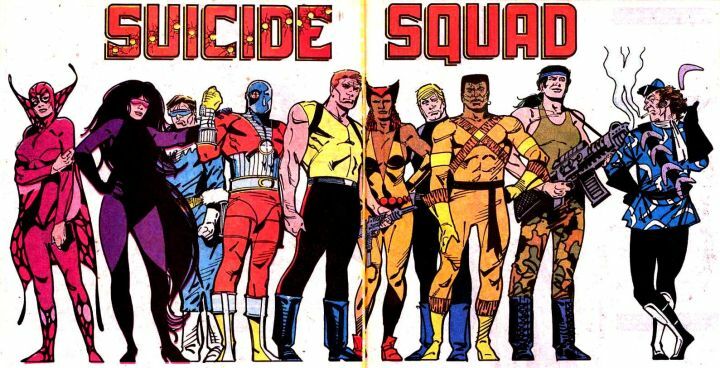 So who are the Suicide Squad? They’re a group of DC villains on a Work Release program, where they can get out of their cells if they carry out dangerous secret missions for Uncle Sam. (What could possibly go wrong?) Most of the characters in the Squad have never been seen on film before, but the gang includes The Joker (his fourth cinematic iteration being performed by oscar-winner Jared Leto), now accompanied by Harlie Quinn. Hopefully this one popular character won’t end up overshadowing everyone else on the team, like Wolverine does when plunked into the middle of a bunch of X-nobodies. So yeah, they’re going for a heavy dose of the grim-and-gritty antihero vibe here, straight out of the nineties Dark Age. Since they’ve already shown a bit of sample footage of the Joker preparing to torture someone, I suspect that even if they add a lot of humor, this is going to have a hard time appealing to the popcorn-munching family mainstream. I guess DC figured that since Nolan’s Batman trilogy has already branded them as the more grim and mature alternative to Marvel’s colorful kid-stuff, they might as well dive all they way into that dark age schtick. After all, it worked out so well in print, didn’t it? But wait, what’s this new rumor? Apparently, the original edit has been hacked to the bone in order to reframe the movie as lighter and funnier than it was originally scripted or shot. The changes are so extensive, they say, that quite a few shots used in the trailers never appear in the finished film. The consensus among critics is that this has left the story quite disorganized and incoherent.